Wharton finally got the ball rolling in 2004 along with fellow firefighters Wade Durbin and Joe Singer and named the Scott & White Marrow Donor Program as the race’s beneficiary. Thus, the “Miracle Match” Marathon was born. Get it? Matching donors and recipients? We’re not a dating service, despite our name… although you never know who you might meet at mile 18. But enough about them. How about the race?? 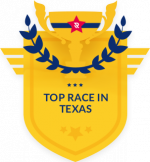 The Miracle Match Marathon has found its niche as “The Toughest in Texas; No Bull”. We’ve got hills. We’ve got a race distance for everyone and every level. We’ve got more hills. Oh yes, and we’ve got a few more hills. Texas-sized medals hand cut by a Waco Fire Fighter who donated stem cells and saved the life of a complete stranger through Be the Match, our cause. And best of all we’ve got tough firefighters from all over this great state running in their turnout gear. And by the way… did we mention the hills?? AND IT’S ALL ABOUT SAVING LIVES!! A picture’s worth a thousand words, but after 26.2 miles of hills, some can’t be said in public… Wait till you see yours.